Q: Is San Juan County at risk for a tsunami? A: The short answer is yes. We live in earthquake country, and earthquakes can (but don't always) cause tsunamis. Please also take a look at our Earthquake FAQ for much more info about quakes. Tsunamis are rare, and there is little local historical information as to their extent or severity. However there is ample geologic evidence that in the event of a large earthquake on the subduction zone located off of the outer Washington coast, San Juan County could expect a tsunami anywhere from 45 to 90 minutes later. Recently scientists have begun using high-powered computers to model various seismic events and the resulting tsunamis. Tsunamis are drastically affected by bathymetry, topography, and geography. According to the latest models, most of the shorelines of the islands will be unimpacted, but in some spots the waters will reach a height of 10 feet above mean high tide, and potentially a height of 20 feet in a few high risk areas. In most cases a tsunami is not so much a breaking wave, but rather a sudden and fast moving tidal surge (hence the name tidal wave). Picture a vastly amplified tide coming in over the course of minutes not hours. In addition this is an animated model of what a subduction zone induced tsunami could look like. Note that this model is somewhat dated, but still gives a good sense of how a tsunami might behave. In terms of timing and the repeated surges. Note that this model does not give a good prediction for height of actual surge over land. There are two other potential tsunami scenarios as well: It is possible that a quake centered within the Puget Sound region could generate a tsunami that would arrive much sooner and be much bigger. Main thing of course is to head to high ground at the first sign of a major earthquake. There is also the remote risk that a major quake in the Aleutian Islands of Alaska could generate a quake that would affect the inland waters of the San Juans. Most likely the damage would be limited to docks and marinas. This is the only scenario in which scientists are predicting damage here from a distant quake, and there would be a number of hours in which to get the word out to impacted areas. 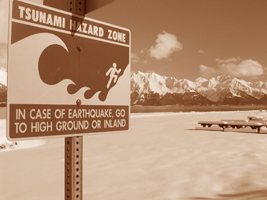 Q: How do I know whether my property is at risk from a tsunami? A: If you live in the San Juan Islands, you can view our online mapping tool to view risks in the islands. This tool has been built based on modelling work done by NOAA and WA State DNR. For locations in WA, but outside of San Juan County, please view the maps made by WA State DNR. Q: On the online map tool, there are areas where the color doesn't extend all the way to shore or appears otherwise disjointed. What's the story? A: Due to the scale of the model and inconsistencies in data sets, the way the model results appear on the map is less than perfect. Unfortunately, you have to use your imagination a bit. If an area shows inundation, count on the impacts connecting to the shoreline. You have to use a bit of common sense for sure... and remember, this is not a tool that is intended to make micro level decisions about risk- but is more intended to help people understand if a given beach, neighborhood, cove, etc. is liable to experience tsunami impacts. Bottom line, areas that have some inundation predicted anywhere nearby should be evacuated, and even those areas on the water that are forecast to have no impact should still be vacated following a large quake. Better safe than sorry. Q: I operate a marina, or live on my boat, and my dock doesn't show up as a hazard zone in the online tool, does that mean I'm safe? A: Not at all. The online tool forecasts surge over land. For infrastructure that is actually in the water, even just the current speeds can be a major concern. All harbors and tsunamis are different, and impacts vary widely, but take a look at this video from Santa Cruz, CA after the 2011 Japan quake to get a sense of why you want to not be anywhere near the water, regardless of what the models say. If you live on your boat, we'd highly recommend getting an EAS equipped weather radio so you can hear the tusnami warning if you don't feel the quake. Also a good idea to have someone you know on land call you or check on you if there's a big quake and it's night time. Q: I looked up my neighborhood on the online tool, and there's no color at all, even though I live on a low bank beach. Why is that? Many areas of the islands are predicted to emerge from a tsunami unscathed (this is good news!). Tsunami impacts are strongly affected by bathymetry and topography- and most of the island shoreline is not affected. That said, no matter where you are after a big quake, it's a good idea to remove yourself from the shoreline until you are sure that there won't be any impacts. This is only a model, based on our best guess and current science- we all know that mother nature has a way of surprising us on a nearly constant basis. And even places that won't see a large run up in water levels may still see extremely strong currents. Docks, marinas, and vessels in the water often see significant damage due to the current, even without the actual "wave". Take a look at this video from Crescent City, CA after the 2011 Japan quake to see what sort of impact a tsunami can have with high current velocity alone. Q: What do I need to know about tsunamis? Your tsunami warning is a major earthquake. If there’s a big quake, go to high ground and get away from low bank waterfront, docks, beaches, etc. Head uphill and try to get at least 30’ above the water, but going higher certainly isn’t a bad idea. There are no sirens in San Juan County, and don't count on other forms of technology. Use common sense and caution and head to high ground if you feel a major quake. Stay high until 4 or more hours have passed or you have other confirmation that there's no tsunami (this is where a hand held radio can come in handy). If you see the ocean behaving in a strange way, head to high ground. The tide going out, unusual currents, or other odd ocean behavior could be the first sign of a tsunami. Remember, the first surge is often not the biggest. Don’t go back to low ground anytime soon. Tsunami impacts can continue for 12 hours or more after the first effects. Getting your boat out of the harbor to prevent damage is a bad idea (again, take a look at this video to get a sense of current speed). While that has worked on the outer coast, where deep open water is close at hand, the complexity of island waters will make for highly unpredictable impacts and current speeds approaching 15 knots or more. Be safe, and head to high ground. Q: Under what scenario would the event modeled in the online map tool occur? A: The inundation modelling is based on a specific Cascadia subduction zone quake, a 9.0. Specifically, WA DNR and NOAA used the L1 scenario from this simulation. There are certainly other possible situations that would create a tsunami, but this one is a good starting point for understanding risk. Q: How long after the earthquake would the tsunami arrive? A: In the most likely scenario the first wave will arrive in the islands about 45 minutes after the quake. That said, in a more local quake, the wave could arrive much sooner. The main goal is to head to high ground as soon as you feel a large quake. Q: How will island residents be alerted of a tsunami? A: When you feel a large earthquake, that is your warning. Those living on boats, sound sleeper, or others living in a tsunami hazard zone may want to consider purchasing a NOAA Weather Alert Radio with SAME techonology. These radios will pick up the tsunami alert and make a loud tone to notify you of the hazard. Keep in mind though that these are pieces of technology dependent on communications systems to operate- the big earthquake is still your best alerting system. Q: Why aren't there tsunami sirens in the islands? A: There are a number of reasons, but the primary reason is that we will feel the earthquake, and that is the single most effective and reliable form of notification we could ever ask for. We'll also likely have plenty of time to calmly head to high ground before the surge arrives. Unlike the outer coast, tsunamis from distant, unfelt quakes are a remote risk. It's also true that we would need a large number of them to cover the islands, and the sirens cost upwards of $100K each, are somewhat expensive to maintain, and have had some issues with false alerts over the years. They depend on infrastructure to operate that could possibly be knocked out by the quake itself, and there is some concern that they can promote an over reliance on technology (i.e. if people feel a huge quake, but don't hear the siren, they'll stay near the water, assuming it's safe). For all of these reasons, we think the simplest, most reliable, most affordable, and best common sense solution is to get all islanders aware of the fact that if they feel a quake, they should head to high ground. Q: My house is in a hazard zone. Will my insurance cover tsunami damage? A: Standard home owner's insurance doesn't cover damage caused by either an earthquake or a flood (for insurance purposes, a tsunami is considered a flood). Both flood and quake insurance are separate policies that you can add to your home owner's coverage. Talk to your insurance agent and have them walk you through the complex cost/benefit equation that can help you decide whether or not to add to your existing policy. Q: Who did the modelling to create the online mapping tool? Q: My property is in a hazard zone, does this mean I cannot build on my lot? There are no regulations in San Juan County controlling development in a tsunami hazard zone. In those jurisdictions in the U.S. where there are restrictions, the only limit is to prevent the building of schools, hospitals, fire stations, and other critical public facilities. Q: How dangerous is a tsunami? A: In the most likely scenario, San Juan County will have plenty of warning (due to the large quake we feel) before a tsunami in the form of an extremely large earthquake. This gives us time to pack up families, pets, and valuables and head away from the shore. The danger from tsunamis comes from rapidly rising water, as well as fast moving debris entrapped in the flow (boats, docks, driftwood logs, and other items become potentially devastating battering rams). It is important that once you leave, you stay high until you are sure that the threat has passed (after a large earthquake, repeated tsunamis are possible over the span of up to 24 hours). Tune in to your local media or your EAS radio for updates. If people are educated and aware of the risk and make prudent common sense choices, there is no reason for anyone to be harmed in a tsunami in San Juan County. Remember though that just because you survived the tsunami, our challenges aren't over. The islands are likely to be cut off from mainland food and fuel supplies for weeks. Advanced medical care options on the mainland will be limited and ferry service may be shut down or extremely limited. Island water and septic systems may be damaged or non-operational. Power, phone, and internet service may be extremely limited or shut down completely. In short, doing everything you can to prepare you, your family, and you community for being completely self-sufficient for 7-10 days is absolutely critical. For help on how to start that process, visit our Preparedness Page. Q: What can I do to protect against tsunami damage? A: The highest priority is to protect yourself and your family. After a large earthquake, act as though a tsunami is coming and move to higher ground. Equip yourself with an EAS radio in order to hear tsunami warnings. To mitigate damage to your home, the first thing to do understand the risk. If you're building in a hazard zone, work with engineers to mitigate against damage. For waterfront infrastructure, in general, the higher the pilings of any floating dock in the hazard zone extend above mean high tide, the better- enabling the piers to float up with the level of the tsunami and avoiding the release of boats and docks as debris. A tsunami is a relatively rare but massive event; the priority is always to protect lives over property. Q: Is there any good news about tsunamis? A: When it comes to tsunamis, we have a number of pieces of good news. One is that we’ll feel the quake that causes our tsunami. Communities on the outer coast can be impacted by tsunamis that come from far away, so they won’t know it is coming. A second advantage of the islands is that high ground is never far away. Getting to an elevation that is at least 30 feet above the high tide would get us out of the reach of all but the most extreme of tsunamis, and that’s never hard to do in the islands. Thirdly, the size of the surge here is forecast to be much less (20 feet max) in most situations, and that's much less than some other communities are facing. There are also a number of locations in the islands that are predicted to be unscathed by any tsunami impacts. The final piece of good news is that we’re a resourceful, resilient, and common-sensical community where people tend to be good at taking care of themselves and each other. This is critical following an emergency, especially when residents have taken steps ahead of time to prepare (as is the case with many islanders). Q: How do I learn more about tsunamis? A: Here is a page of links to other resources about both tsunamis and earthquakes. Q: I'm a property owner or manager of property in a zone that looks like it's high risk. Should I put up warning signs? A: Yes, please- that would be great. And we're happy to help. Ideally public places in high risk zones would feature signs that look something like this. Contact us to help figure out how to get signs and how best to mount them so they don't "disappear". A number of locations in the County already have these signs posted, including Ports, County Parks, and State Parks. There are a number of spots that would benefit from them that have yet to be signed though.